Just a few minutes old! We aren't! But we had a call from a guy looking forward to hunting and actually capturing an alligator. He said he'd read all the suggestions from DNR and websites he could find, and wondered what we'd heard from guys who'd actually nabbed one. So, if you've got some suggestions that worked for you last year, please post them here. If you have some pictures to share, email them to claudia@cordrays.com and we'll share them, too. 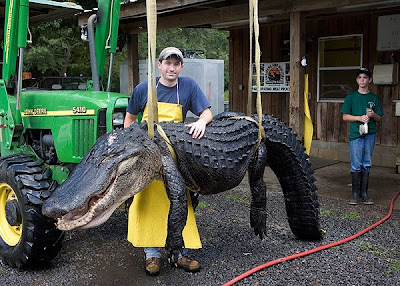 The guy that killed this huge one suggested that you should start weight lifting now! Welcoming a new Clemson Grad! As you might have noticed, I've not kept up with the blog too much in the last few weeks. It's been a whirlwind of activity around here, starting with this photo. Kenneth graduated from Clemson on May 8th, making our family a full house of all Clemson graduates. 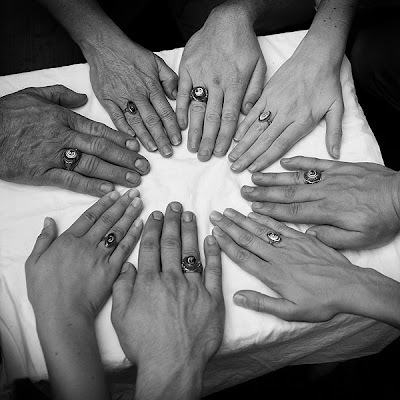 Starting from the top left, you can probably guess my and Michael's "more mature" hands, then Tristan and Callie Cordray, then Jeff and Michelle C. DiMaio, then the new graduate, Kenneth and his then fiance, now wife, Kristin Kierspe. We've all talked about getting this photo made for years. We finally did it! Thanks, Michelle! Kenneth will be continuing his taxidermy business and joining us with venison processing and Cordray Farms. We are excited to welcome him home! Cordray Farms beef grows on grass and hay. I'm going to try to keep you up-to-date on what goes into that process. It always starts with machine repair! This is the mower that cuts down the tall grass for baling. The blade seems to be stuck! Are you a Wild Palmettovore? The SC Department of Agriculture is encouraging folks to become Palmettovores. That's anyone who tries to eat food born and raised or grown in SC. It's a cute ad campaign, but I think it's leaving a ton of us out! What about all us Wild Palmettovores? We eat wild shrimp caught right off Folly Beach, catfish from Pinopolis, wild hog sausage from Ravenwood, and venison summer sausage from deer taken in our own backyards! And that's not even talking about the upstate rabbit hunters and midlands turkey chasers! I'm trying to contact the Ag guys to let them know that there's a bunch of us out here wild about SC food! Check out the link at the very bottom of this page to see how long until Opening Day!